This is an inspiring story and it holds the reader from the first page. Good books inform and entertain. This is a good book. The author is a writer who embarked on an extraordinary adventure. The result is a well-written book. 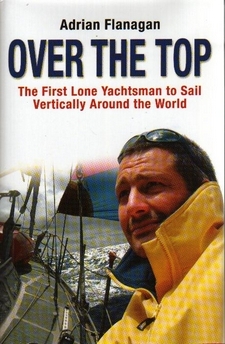 The adventure was the first attempt to complete a vertical or bi-polar circumnavigation by sea. The idea took root while the author was a teenager. The events of life conspired to delay the adventure for three decades. Many have a dream, see it delayed and never pluck up the courage to make it happen. Flanagan sets the scene with a brief and readable background to his life before the adventure. The task he set himself was considerable. He had to acquire the necessary skills of seamanship, find and equip a suitable boat and then sail his dream. That would have been a serious challenge for a novice sailor, but he planned a course that would tax the most experienced yachtsmen. It involved sailing from the South Coast of England, down through the Atlantic, past the Falkland Islands, round Cape Horn against prevailing wind and currents, north through the Pacific to the Bering Strait and then along the Russian northern coast, round the top of Norway and down the North Sea to the English Channel and back to Southampton Water. The preparation was compressed into less than a year and the expedition was largely funded by mortgaging his home and using all his savings. The voyage was full of extreme tests, not least in obtaining the first permission from the Russian Government for a single-handed sailor to transit the Russian Northern Sea Route. This entry was posted in Alpha Global Expedition News by AGX Blog. Bookmark the permalink.